I was in Glasgow over the last few days, the city where I was brought up and like everything in my life it has a vintage element to it as the reason for my visit was to look after my vintage mum! Glasgow has changed from when I grew up and I came across the images from the hugely successful 'Glasgow's Miles Better' Campaign launched in 1983 and was one of the best promotions ever mounted by a British city.The campaign aimed at correcting the outdated ideas that many people in Scotland, the UK and abroad had of the city. 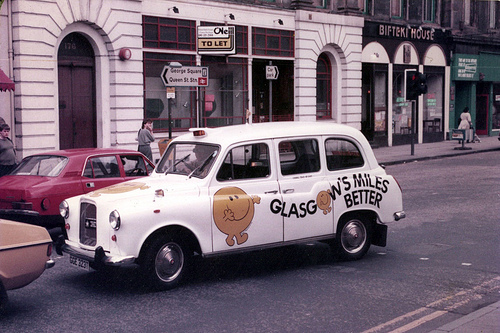 The low budget campaign featured Roger Hargreaves' smiley 'Mr Happy' character telling visitors that Glasgow's Miles Better. I saw this Rolls Royce shown below parked in a driveway near my childhood home. A very different image from the 1980's now that most people have become homeowners and take pride in their homes, gardens and cars. Miles better!